Social Media in 2011 as an exercise in learning, social media as transmedia platforming for learning, and social media as elements in larger ecologies that themselves "learn"
Thank you for inviting me to participate in this workshop. I am excited to be thinking with all of you about online and distance education. Speaking from my own research and experiences I intend to consider some SOCIO-TECHNICAL-PEDAGOGICAL communications that matter today and could continue to matter over the next 5 years. I will also reflect on what sorts of INTERFACES are valuable sites for feminist meaning IN THEMSELVES, as well as platforms for learning. 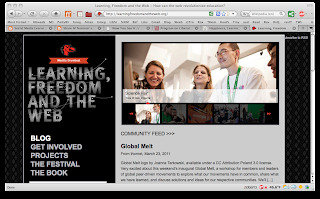 I approach this question as one of SOCIAL MEDIA LEARNING…. Whatever might be hopeful, innovative, exciting about offering a BA and MA in Gender Studies as a distance learning project, comes in a necessarily altering infrastructure for gender studies. A very mixed bag of the commercial, the restructuring, and the social ecological. These are what social media network among today. What’s to worry about? Since it is impossible to disentangle any project for distance learning today from the politics of economic restructuring, how must one buy into that? How does one keep from somehow then disabling Gender Studies and its epistemological commitments? I think the whole point is to make that central concern THE VERY HEART of any such program: to use it to investigate these very issues with the very tools that emerge from this nexus. 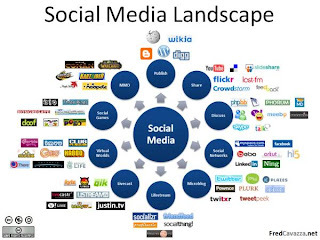 Using social media for learning, and directing analysis to social media at the same time, are ways of understanding more clearly the many systems within which they are embedded and the forms of agency involved. These are not simply either human or technological, but rather call into question simple nature culture divisions, or human instrumentalisms, or agencies understood as forms of control and prediction. Emergence and self-organization are forms of connection that we all need to encounter, participate in, and understand more carefully. They characterize the global financial systems mediated among media; some natural ecologies of which media are now actually elements in dynamic interaction; neurological rewards and attentions entertainment and educational media elicit; as well as operate more and more obviously as mechanisms of global social change. Social media are agencies in these in a range of striking forms today with implications for politics, ethics, and living. Learning in each kind of engagement with social media is thus an opportunity to develop and participate in a feminist transdisciplinary posthumanities, itself an altering encounter of gender studies and economic and social environments. I have been encouraged myself to approach social media learning with more care by a book that publishes the final report of a large US MacArthur Foundation project hubbed both at the University of Southern California, and at the University of California at Berkeley. This meta analysis of twenty odd collaborative research projects investigated how youth -- from a range of diverse venues in the US and from the first teen years through college – use social media. This work draws upon GENRES OF PARTICIPATION as described by actors in the research, who call their and others’ activities “hanging out, messing around and geeking out.” My own bottom-up experiences entering into gender studies from the 1970s on, found resonances with this terminology. Learning and teaching with and about social media as a feminist project collectively, quite possibly works with all three of these genres of participation, and they, despite my personal trajectory here, don’t reflect increasing mastery -- either of a field or set of fields themselves, or by individuals initiated into that mastery -- but something rather more interesting, flexible and generative. A trajectory of mastery is precisely what it does not exclusively celebrate, but actually rearranges -- with, I think, implications for better ways of understanding feminist knowledge worlds. The value of distance education is paradoxically social, in that it rearranges who is where, with who else, and through what means. (As you all know) Not all distance education is online or computer mediated. Not all distance education is never face to face. Not all distance education is isolating or even individual. Social media learning puts all that right up front. And despite the ways we may conceptualize social media, its ecologies are continuous with our many worlds, not something exclusively technological or even wholly media-driven. That these ecologies will change over the next 5 years is given. That gender studies will change over the next 5 years ought to be as given, as clearly dynamic and contingent. Social media learning is thus a properly altering infrastructure for gender studies, whether for this very program or for any gender studies located anywhere today. One in which learning is the condition of both students and teachers in conditions emergent and re-organizing as global academic restructuring continues or is challenged or is altered. According to the analysts of the Digital Youth project report, these genres of participation make clear that working with media is likely to be social rather than individual, context and situation dependent, and is continually recrafted in practice that is sometimes individual and often collective. Genres of participation are not platform specific, which matters a lot when thinking over time, but instead crisscross cultural referents, technology workarounds, and media contexts. These are CONSTELLATIONS, subject to experimentation by students and teachers who occupy a range of locations and collectivities amid social media ecologies. 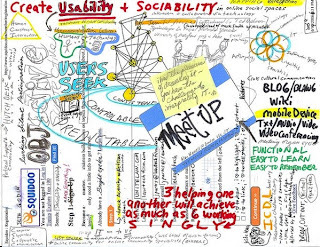 One student may be hanging out with various collectivities, project-driven or place-specific or interface specific, gathering information, attending demonstrations, participating in conversation, indeed mobilizing multiple media intensively to cross platforms, constituencies and forms for information sharing. My own first experience of this sort of MULTI-CHANNELED IMMERSION happened in the online virtual world Second Life. I had signed up for SL to spend time with a old friend living on the other side of my country, who had moved to take care of her daughter’s new baby, and was thus isolated from her own friendship network. She had heard that SL had live music venues 24 hrs a day, and invited me to meet up with her there. I had just upgraded my computer and was suddenly technologically prepared. Within days she got very involved with making virtual musical instruments and creating animations and sounds to play them with. I instead got involved in various international professional educator groups and started regularly attending their meetings in SL. Within a couple of weeks of my signing up, the yearly VW Best Practices in Education Conference convened. I was excited to discover that the keynote address was to be given by Tom Boellstorff, whose queer anthropologies of Indonesia I had long followed, but whom I had never met. He had recently published a book, Coming of Age in Second Life, which was both an ethnography and also a primer for research methodology in virtual worlds. Boellstorff gave his talk in voice, I listened to him on my computer’s sound system. While he was talking, a back channel of text chat was going on simultaneously, as folks all around were greeting each other, commenting on the presentation, sharing information about what else was happening where, and so on. As Boellstorff spoke I was suddenly struck with a new insight about something I had noticed in my first weeks in SL: the many seemingly empty simulations or sims in which I had wandered, operating, touching, activating scripted objects as the sole avatar around. I had found this experience lonely. But as he spoke I suddenly realized that I had thought of only avatars as real somehow, hooked up to real people, everything else as an emptiness. But then I realized what I was experiencing was actually the agencies of technicities: of those scripted objects, with whom I was sharing interaction and even intention. I swear that in that moment, my first experience of this multi-channeled intensity and convergence, in which several realities all at once were co-present for me in an extensive network… I swear that my dopamine levels went through the roof. Suddenly my experience of Second Life had taken on a whole additional layer of pleasure, engagement, meaning, possibility. Hanging out, messing around and geeking out are all ranges of intensity that ebb and flow within and among social media, as the social gets rearranged and our very neurobiology hooks into the ecologies interacting. This is what we want for students and teachers, what we want to hook up for learning, what we also want to examine and understand as an element in the ecological systems which all of us, and which gender studies too, are all now a part. Is it addiction or is that another moral panic? Is it biology rather than the social, or is that a false dichotomy? Is it something to refuse ascetically as a refusal of the commercial and the exploitative? Or does that assume an outside that no longer exists? These are some questions for a feminist transdisciplinary posthumanities that illuminate other questions long the stuff of gender studies. Social Media learning is both scholarship and practice. 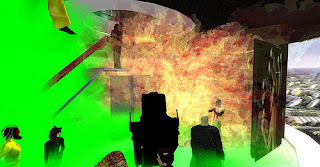 Younger folks I run into are generally artists, mostly new media artists who are making machinima, music, virtual sculpture and more, as well as folks who just love to create whole environments that do things. I am not proselytizing Second Life or any specific platforms, commercial or otherwise. I am not a technology evangelist. Personally I prefer what I call “worn tools.” That is, absolutely NOT whatever the latest this or that is. Thus in my own classes – none of which are distance learning courses at this time – I use stuff that is, first, PUBLIC, commercially available for free, that’s been around a while, that is the clunkier version of its type, and I add it to my toolkit in either bursts of dopamine driven pleasurable intensity, or a little bit at a time in the evening for relaxation, maybe while listening to audiobooks. Right now I usually work with Blogger, YouTube, and Google Images, Books, Search, Maps, Documents, and Visualizations; occasionally supplemented by iTunes, twitter, Second Life and facebook; and this or that as it falls into my lap, TinEye, Jing, or Scribd, say. I am playing with Storify now and I think tumblr is next. 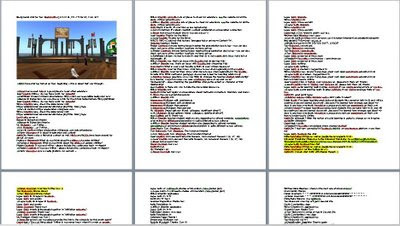 All of my courses now have an accompanying website that I use for multimedia class presentation – I hardly ever use Power Point which is probably obvious – and I use Blogger as my website authoring convenience. 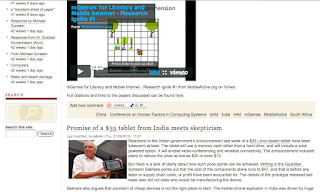 I use Blogger for classes and for talksites when internet access is easy and I have multimedia to share. Although I began using WebCT in 2005, my university’s move in 2007 to Blackboard coincided with my own disillusionment with these gated learning systems, which I abandoned then in favor of these tools I’ve mentioned. At that time it was difficult to use multimedia in Blackboard. Of course that is no longer true, and one of my much appreciated neighbors in Second Life is an award winning application developer for Blackboard, so I hear about some of the latest bells and whistles still now and then. But I like being public on the web, a person professing, not in a gated learning community, and I also value that students using Blackboard mostly learn how to use Blackboard, but when they hang out, mess around with, or geek out on social media, they can use it for lots of intentions. This too is likely to be altering, and I don’t care to predict the future of learning platforms. These gated learning systems are especially useful for managing large distance only classes and I know folks who find them invaluable, as well as great folks making them better all the time. When I took classes in Second Life on teaching in SL from the Sloane consortium I met other folks who were entirely online educators, some for entirely online universities, some of those for-profit institutions. Closed systems mattered a lot to them, they were negotiating content development and management, intellectual property issues, and divisions of labor in which course development and teaching were done by different folks. 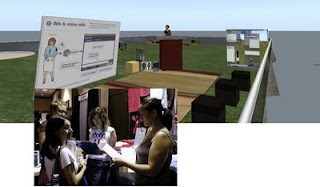 They usually taught very large classes and used Second Life only for professional workshops, for counseling students, for teacher office hours, and for other small group activities where co-presence and empathetic engagements were especially important. Although some folks manage it, I would not want to teach more than 15 students at a time in SL if that were possible. It would make a great environment though for seminars, and especially for project-driven, constructivist learning. 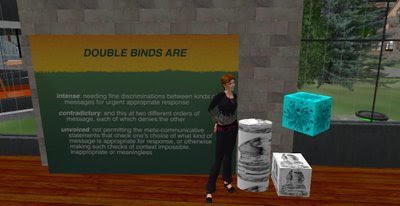 I have led an international feminist reading group in Second Life on and off, and it is a very nice environment for that, can be conducted in either voice or text chat, although I prefer text chat myself. 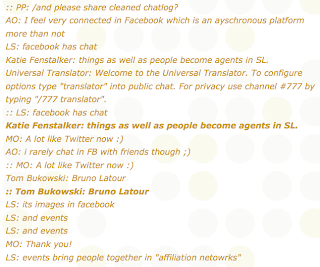 I much prefer SL to Skype, Google Talk or other online phone and video conferencing tools. I just find it a lot more fun, playful and prettier. Just about every element of distance learning quite properly puts into perspective and could be used to make visible the very conditions of contemporary learning, how what we know about it is changing, and how it is interactive among knowledge ecologies in discontinuous layers, accretions and assemblages. There are undeniable gender, race and labor gaps in technology use, a bunch of so-called digital divides. 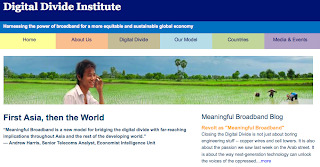 Each of these are variously organized in particular places across varying axes of development and commercialization of broadband, computer availability, media rich and poor environments; knowledge and interest disparities, commons, and privatizations; family and school resources, literacies and languages. As are other elements of social life, all these are unevenly distributed, subject to macro and micro political power, and agencies for oppression and liberation. Our use of them, the very material limitations on their use for distance learning, is itself a subject for feminist analysis for project-driven, policy-sensitive, constructivist practice. Transversal intersectionalities are instantiated in these and are required to work with and understand them. As the Digital Youth report demonstrates, hanging out, messing around and geeking out are ways of considering and working with the ebb and flow of intensity and possibly here. The typical and the possible are often at odds when most folks cannot participate in something that some more intensive group can. Expertise itself is a kind of exclusive intensity as geeking out, but one can geek out in one sort of media practice while simultaneously hanging out or messing around in others, with various others. Transdisciplinarity requires that who is expert and who is legitimately peripheral in participation, communicate with respectful attention to each other and believe that they have something to learn from each other. Messing around, as experimentation and play, is also a form of peripheral participation. Workarounds can be about getting around the rules, from those of social organization along axes of illegitimate power, to media ownership and property rights, to the gatekeeping of identities of expertise, to access to the internet. We had some dramatic examples of workarounds for these last recently when the government of Egypt cut off internet access, and folks used the workaround of calling friends in other countries on the phone to publish their tweets on breaking news and events. 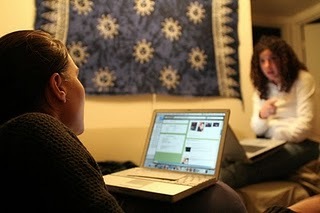 What would distance learning mean if it were not only permitted for the education of single students who were managed by their individual payments, but also a seat could be for a small group of students, or perhaps a family, who collectively operated as a peer to peer community in interaction through the distance formats? Shared learning nodes in communication? On facebook my teacher friends have running threads about the management of unruly students with laptops and iphones. They have rules: no laptops in class, they are distracting. No using the Wikipedia, it is not an authoritative source. But what about multichannel immersion, the dopamine spiking pleasures of which I learned in Second Life? 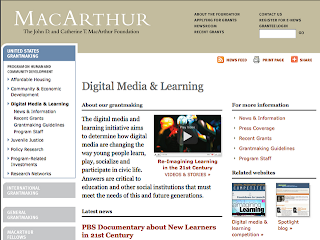 I would love myself to know more about the experiences of educators now creating game-style learning environments, such as Quest to Learn, another MacArthur supported project in NYC. I would like to learn how to structure learning activities that work with these neurobiological elements just as game designers learn how to structure games that do. 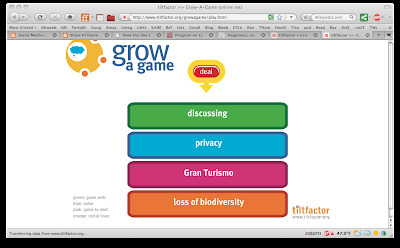 From my collaborator for my Feminist Social Media Activisms course this term, Jarah Moesch, I learned about her work with Mary Flanagan’s Tiltfactor game lab and a whole range of their games online. We have used this one, Grow a Game, in which you keep re-dealing a deck of cards as you brainstorm how to modify an existing game to achieve a social justice goal, playing by juxtaposing a particular social value with a verb from which to imagine new game action. So I not only permit but ask students to bring their laptops, if they have them, or to share them with other students, to work in a media intensive classroom, to experiment with tweeting class content, or using twitter to organize class projects. I ask them to become editors of the Wikipedia, which has very few women writing for it now, and teach them to read the history section of each article, which can be used as a site for considering what issues are under dispute underneath seeming authority. Cathy Davidson, co-founder of Humanities, Arts, Science, and Technology Advanced Collaboratory, or HASTAC, at Duke University, points out in her soon to be published book on the sciences of attention, that we need to unfocus as much as we need to focus. 1. Strategy — what’s your big idea? 2. Story — help people understand it. 3. Tools — set up simple tools that make it easy for contributors to see what’s happening and get involved. 4. People — who are you trying to reach? how can they help right now? 5. Prototype — build fast. test and improve it together. Students will be offering a workshop on social media projects for the Theorizing the Web conference at Maryland when I get back. I am delighted to speak more fully to any of these dimensions during our discussion period. This lunch to lunch workshop will explore different possibilities for online teaching and learning in of Gender/Women's/Feminist Studies. Different experts from Sweden and abroad will be invited to discuss socio-techno-pedagogies of today and in five years time. The main concern for each participant will be to envision, from the perspective of her and his own research or experiences, what an ideal virtual class room and assorted interactions and assignments could look like for BA and MA students in Gender/Women's/Feminist Studies. What kind of interfaces, what kind of socio-techno-pedagogic communications etc. would be appropriate today as well as in 5 years time - in order to skillfully train students online and in distance education? I am Professor of Women's Studies at the University of Maryland, College Park, and a Fellow of the Maryland Institute for Technology in the Humanities (MITH). My Ph.D. is from the History of Consciousness at the University of California, Santa Cruz, with interdisciplinary scholarship located at a juncture of feminist technoscience studies, intersectional digital cultures and media studies, and LGBT Studies. I have published two books, Theory in its Feminist Travels: Conversations in U.S. women's movements (Indiana, 1994) and Networked Reenactments: Stories transdisciplinary knowledges tell (Duke, 2011) and am now working on Attaching, for Climate Change: a sympoiesis of media, and Demonstrations and Experiments: Quaker women at the origins of modern Science.